Copying this card is not enough, were we to make a profitable version it would need to be cheaper, and if we were reviving this product its replacement will need to be better. To pursue both of these an understanding of the originals function, and how it functions is essential. The most ovbious parts to save to save money on are ICs1-16. The cheapest 0.1" pitch DIP package with 128K×8 (at the time of this article) is Digikey.com:BQ4013YMA that hit our 4.5-5.5 VCC sweet spot, is Non-Volatile (NV) SRAM eliminating the need for IC 27 and a battery, and at $25.94 per IC, it would cost $415.04 before applying the new HST and Eco taxes for enough capacity. If we were to move to a surface mount 0.05" pitch SOP package such as the Digikey.com:IS62C1024AL with 2.0 V data retention threshold and the same VCC, it would cost $4.23 per IC, $67.68 for all sixteen. 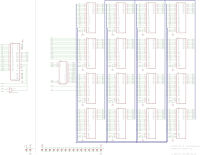 Buying Sixteen 128K×8 ICs is silly when we could subsititute a single 2048×8 IC for ICs1-16 and IC 23. 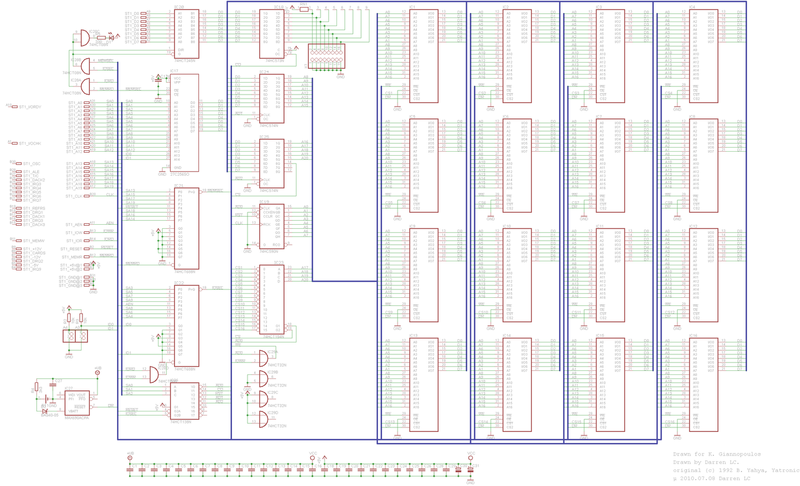 Reducing our component count and board size by more than half, while remaining software compatible with the original. ICs1-16 can only accept address lines 0-16, but each can be individually addressed, therefore IC 23 decodes address lines 17-20 and individually addresses ICs1-16. If there is only one SRAM IC then a decoder is unnecessary and can be eliminated while leaving the original software completely unaltered. 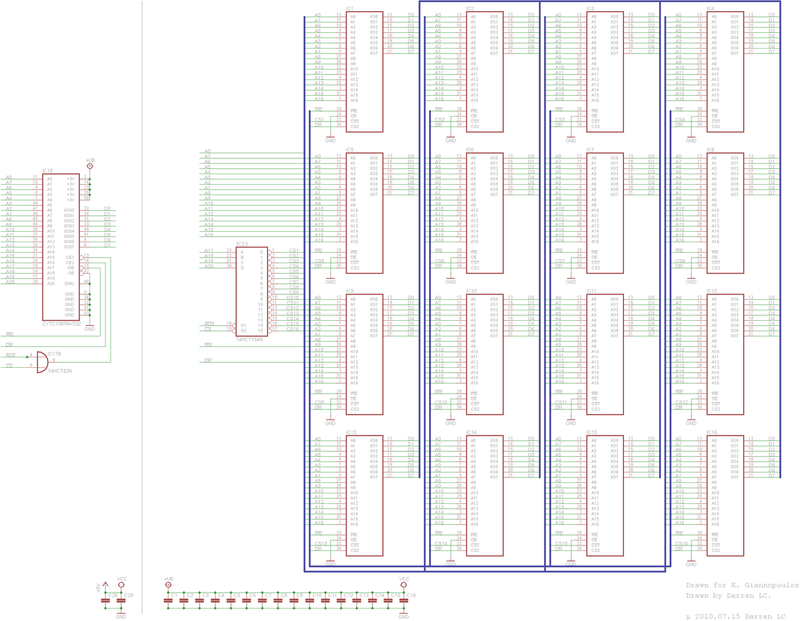 Illustration of difference in complexity between using a single surface mount IC w/ an unused or gate from the original, and the orignial's 17 ICs. Additional power circuitry required. A single 2048K×8 DIP such as the Digikey:BQ4017M would set us back $107.84. Or a 0.0315" pitch TSOP like the $44.44 Digikey:CY7C1069AV33. Both of which are a king's ransom compared to a $7.22 Digikey:NAND512W3A2DN6E 512MB Flash 48-TSOP-II, or a modest $1.07 Digikey:SST25VF040B 4MB Flash 8-SOIC, both of which would require the use of different hardware and software. I should be able to learn enough from reverse engineering this hardware to better understand how it works and where we might find areas of improvement. IC28C will turn off D1 sinking current to drive LED. When (AD0=0 and CS=0) IC23 decodes A17-20 and activates the correct CS1-16 for the SRAM array, else they are all disabled. When system CLK rises IC19 outputs its register to A0-7 // if system CLK does not cycle after AD0 then an address is skipped! D6-7 is loaded for no apparent reason // load balancing for lower quality components? to make routing the wires more difficult? To avoid colleagues complaining about not having all lines of the databus connected? The SSD's address without jumpers is 318H, with JA3 is 10H, JA4 is 306H, JA3,4:300H . An IOread to 0x__302 would activate CO and IC18 would load K1 onto the system databus via IC20. An IOwrite to 0x__302 would also activate C0, but, but IC20 would change direction and 'fight' it potentially damaging the chips - This would be bad. Similarly any read or write to 0x__304 where bit D5 is set, activating CS, should not be followed by an instruction that makes use of the SSD's databus except to access SRAM- this would also be bad. Our ROM base address is 0xD8___.